First Paragraph(s): A thousand years of peace had come to an abrupt and violent end. Off in the distance, trees that had stood eons longer than there have been inhabitants in this quiet, peaceful world collapsed to the ground. The thunderous boom resulting from the massive structures meeting their untimely demise echoed throughout the red forest. The creatures that called this very old, very simple place home felt tremors for miles in every direction. In response to the commotion, frightened groups of these thin, pale-skinned beings took to the treetops, hoping to learn the cause of the disturbance. Making use of limbs longer than the whole of their bodies, they scurried up the sides of the massive growths. One by one large, egg-shaped heads containing grotesquely large eyes parted the densely covered foliage, breaking the crest of the afternoon sky. Like a flock of birds, their heads moved in silent unison, focusing on the ruckus in the distance. Less than a mile away, patches of trees toppled to the ground as great plumes of dust and smoke rose toward the sky to take their place. The monstrous wall of debris began to spread across the forest, blocking out the light of the three sister suns. For the very first time in its history, this place was slowly being enveloped by a darkness brought on, not by night, but something else entirely - something evil, angry, and aggressive – something that would change it forever. Do you like a nice middle grade story involving plucky protagonists literally sucked into a fantastical world where magic happens, Esteemed Reader? Of course you do, you're here:) You're going to love Forts and you should pick up a copy straight away. It should come as no surprise I'm a fan of author Steven Novak. He's a writer of gloriously violent horror fiction for older readers as well as enchanting stories written primarily for children. He's a man after my own heart:) He's also designed the covers for my books, including the newest, a middle grade book revealed last week. So you know I think his artwork is top notch, but can the man write? Esteemed Reader, he can and how! I've enjoyed his Breadcrumbs For the Nasties series immensely, but as with most of the adult horror stories I read, I won't discuss it here. 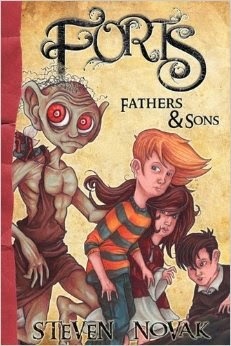 Instead, I recently read Forts: Fathers and Sons, a decidedly upper middle grade tale, and enjoyed it so much I'm looking forward to volumes two and three. The first thing I couldn't help but notice, given my great appreciation for Novak's artwork, is what a really great looking book Forts is. Seriously. If you're thinking of publishing your own middle grade book, this is the way to do it (I read it just in time). It's well formatted and the wonderful illustrations throughout enhance the reading experience. Even after reading the book, I find myself flipping through the pages to enjoy the pictures again. So, Esteemed Reader, as you can no doubt deduce from the first paragraph above, the magical land of Fillagrou is in a hard way due to warfare being waged by the Ochan Army. It's tough times, but as it happens they've been waiting for five children to come and restore order to their world. Fortunately for them, in the first few chapters of Forts, we might five such children. Instantly, Nicky recognized that his brother was in bad shape. His hair was a mess, his head hanging low, his expression tired and forlorn. The look on his face vaguely resembled the looks Nicky had seen on the animals at the zoo a week earlier when he class had been on a school field trip - sad, lost, and hopeless, as if they were meant to be somewhere else, to see something more but yet had been completely and totally unable to do so. Up the stairs went the mad pair of wildly flailing bodies; up the stairs and into the bedroom at the end of the hall; the terrifying noise muffled by the heavy slamming of the door. With his every limb shivering, Nicky Jarvis crawled back in front of the television, grabbed the remote and turned the volume up high. It was not that he did not want to hear the sounds that came from upstairs, but rather that he somehow instinctively understood that his brother did not want him to hear. The Jarvis brothers immediately had my empathy and I was particularly touched by the way Tommy draws pictures for his little brother to cheer him up. If ever two boys were in need of a fantasy adventure in a far away place, it's these two. More, I like that Novak treats this element of the story so seriously. Because their issues are presented authentically, the fantastic is all the more believable and magical. Before Donald followed, he put his arm behind his back, poking questioningly at the seat of his jeans. After confirming that he had not pooped his pants, he quickly caught up with the two. And that's about as much of the story as I can reveal without spoiling. There's a nasty prince bent on seizing power over Fillagrou (isn't there always) and though the odds are far against our five heroes, if they can somehow manage to work together, there might just be hope yet. As he started to toss the sack over his right shoulder he noticed that the one functional strap was torn, rendering it useless. He stared at it for a moment, allowing himself to fully absorb the stinging pockets of pain sprouting up on various parts of his body like the glow of lightning bugs against a pitch black night. Every last ounce of blood in Chris Jarvis’ body quickly rushed to his head, slamming into the underside of his brain like a train smashing into a car left on the railroad tracks. He loved his father, but not quite as much as he hated cars, and grease, and working under hot cars while covered in grease. In every direction trees were tipped over and shattered. Clumps of dirt and grass were strewn as if the earth had been lifted up and tossed into the air with no regard for where it might land. A thin cloud of brown dust and dirt permeated the air, blanketing everything for miles in every direction. Vision beyond short distances was almost impossible. STANDARD DISCLAIMER: Book of the Week is simply the best book I happened to read in a given week. There are likely other books as good or better that I just didn't happen to read that week. Also, all reviews here will be written to highlight a book’s positive qualities. It is my policy that if I don’t have something nice to say online, I won’t say anything at all (usually). I’ll leave you to discover the negative qualities of each week’s book on your own. Hmm...interesting. Thanks for bringing it to my attention. I'm not sure my 5th grader would like it, but I'll look into it further. Sounds interesting especially with spunky protagonist and a strong brother bond. Might be a little old for my child yet, but going to add it to the list to explore for later. Thanks for the review.